What a day! I did all my commenting for 'my' challenges (CASology, Muse, OLW, CAS(E) This Sketch) in the early afternoon, leaving lots of time to make a card for MASKerade today. When I got up to my craft room, I had "challenge paralysis"! There were so many of my favourites floating around in my brain - Fusion, Festive Friday, CASual Friday, Less Is More. And I couldn't move. I know that for many of you that would all come together nicely (maybe not the two colour challenges) and you would come up with a super all-in-one challenge card. Sometimes it even works for me! But not this time. My husband and kids made dinner (home made calzones - YUMMY!) and got everything ready while I filled up my recycling bin. I finally came down for dinner, resigned that I didn't have anything. All thoughts of challenges flew away and I settled into the familiar Ardyth terrain of a rainbow. A Lego rainbow. So Michael and the kids ended up cleaning up after dinner, so I could dash upstairs and get my idea down on paper (aren't they great?!). But I still had to drag out some lamps to take the photo since the natural light was pretty much gone for the day. I used a Papertrey dot stamp (Polka Dot Basics?) and a Just Rite sentiment. Glossy accents for shine and texture (still wet in the photo!). I'm still picking my jaw up off the desk...Lego's? You are AMAZING, Ardyth...Honestly! Your card is so fun and bright, and just plain FABULOUS!!! That is just SO COOL!! I wish I could translate ideas into fabulous cards the way you do!! Oh goodness...the end result is fabulous! That's a great card and story behind it, Ardyth! You know I was sure I was a follower of your blog already but when I went to look for you on my blog list you weren't there! Well, now I'm a follower. :-). Love your work by the way! Lego was never so tidy in our house! I can still hear the noise as the kids scrambled and scraped their way through the box looking for that a single hiding at the bottom! Love the added Glossy Accents on that OCD rainbow! And big thumbs up to your very well-trained family for stepping in. Really fabulous Ardyth, and I think I need to CASE it. Isn't it funny how something hits you once your brain relaxes and off to the races again! Happy Sunday! The shine makes this design rock! Obviously your nojo turned into a mojo the second the ping hit! Fabulous idea! Oh my this is so cute! It looks like little pieces of candy! Brilliant - so imaginative, what a fun inspiration those Legos gave you! 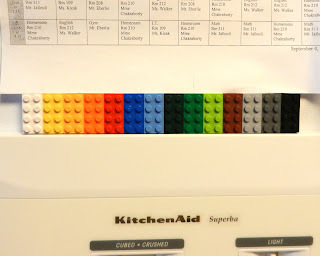 Lego fridge magnets as inspiration for what becomes a fantabulous card? LOVE the 'plot' and especially the result! The parts where your husband and kids make dinner and clean up - awesome! My fridge has Hoops and Yoyo magnets (the silly little critters) so perhaps the 'message' is for pink and green...thinking, thinking! Thank you SO MUCH for commenting on my posts as well as all the others (that must be nearly a full time job in and of itself!). Your comments are valued, as is your creative genius! ok, I want your frig now! This is just an amazing card, so clever and extremely creative! What awesome magnets and brilliant inspiration! GREAT card! Reminds me of rows of gumballs. :D And ... proving once again, sometimes when you are least inspired, just open your eyes to what's around you, huh? I tend to get inspired by tissue boxes. Hee! So much about this I love ... your story behind it, the fact that your family made and cleaned dinner so you could craft, that you have Legos on your fridge, and well, of course, your card! Again, I feel the need to run my fingers across your card!